The is the first new release of VEGAS since MAGIX bought it from Sony early in 2016. In spite of its new ownership, the software looks and works pretty much the way it did when it was owned by Sony. There have been only very minor changes to the look of the user interface such as some slightly redesigned icons. Apart from that, if you are accustomed to an older version of VEGAS (see for example my review of version 11 of VEGAS Movie Studio from 2011), then you should feel very much at home with this new release. 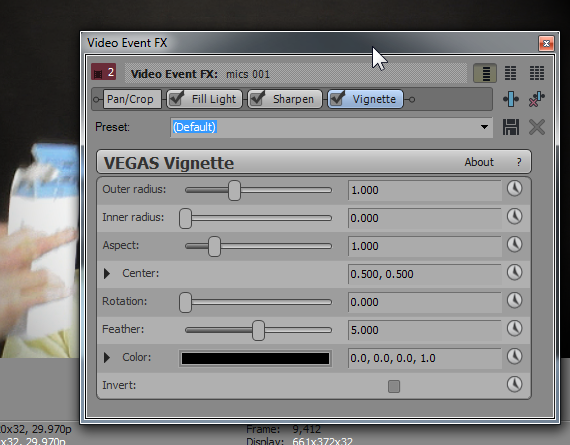 VEGAS is a video editing program for Windows. 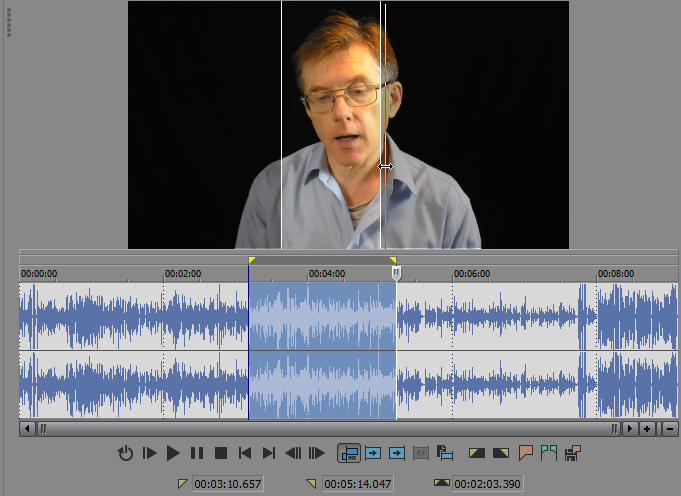 It lets you import and edit video and audio clips by placing them, onto tracks in a timeline area. There you can cut, copy, trim and move the clips. You can add effects, transitions, zooms and pans. And when you are happy with the end results you can create your final video in a large variety of configurable formats. 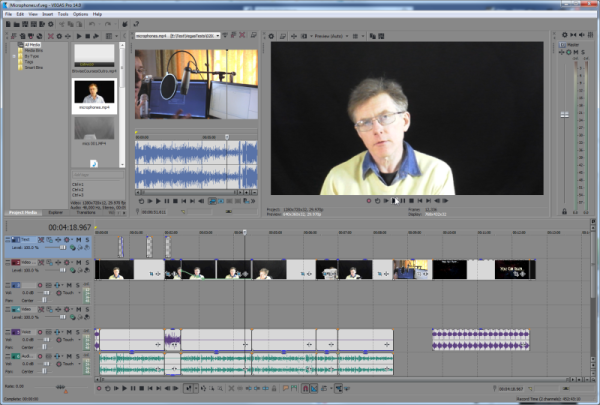 One of the new features that MAGIX are keen to highlight is the ‘hover scrubbing’ mode in the trimmer window. You can edit individual clips by loading them into the trimmer window where you can preview the clip and cut out a section to create a smaller subclip. By tradition, the trimming is done by selecting regions on a track shown beneath the video preview. By enabling hover scrubbing, you can work much more quickly by simply hovering your mouse from left to right over the video preview in order to scroll rapidly through the clip. When you see an appropriate start-point for your subclip you just click the mouse then carry on hovering until you find a suitable end-point, then click again. You can hover your mouse over the clip preview to scroll quickly through it. One curious feature of the Trimmer window is that the popup menu from which you select options is disabled when you turn off hover scrubbing. I spent some time trying to find out how to turn that option on again, but since the appropriate menu no longer popped up, it seemed impossible. Finally I discovered that if I opened up the wave-form track displayed beneath the window, I was able to click on that in order to display the menu. I presumed that the vanishing Trimmer menu was a bug and I have reported it to MAGIX. I am told it will be fixed in a forthcoming update. If you want to speed up a clip you can do that by adding a ‘velocity envelope’ that now speeds up the clip by up to 40 times. The velocity envelope is shown as a horizontal line on the clip and you can add points to the line to increase or decrease the speed at selected points. The velocity only applies to video, however, and any accompanying audio is not synchronized when changes are made. There have also been a few additions to support high definition and high frame-rate video. For example, if you are working on a 4K video project and you need to include lower resolution video clips, VEGAS can ‘upscale’ those clips to improve their appearance when viewed at a higher resolution than the one in which they were recorded. If you are making slow-motion videos, you can simplify the inclusion of videos recorded at a high frame rate (say 120 or 240 frames per second) into your lower frame-rate videos by selecting the desired playback rate and letting the software automatically calculate the necessary adjustments. Other additions for 4K video include support of Black Magic and RED Digital 4K cameras and rendering in HEVC/H265 video formats. A new Smart Zoom plugin has been added. That lets you select the plugin from a list, then, in a dialog, pick the zoom level and the centre of the zoom to add panning or cropping to a video clip. The Smart Zoom plugin is an alternative to the regular pan/crop tool and it is aimed at preserving the sharpness and resolution of a video when zooming. At this point, it’s probably worth mentioning that VEGAS makes fairly extensive use of plugins. To use one, you click an icon in a clip on the timeline to pop up the plugin selector. Plugins can do everything from correcting the colour balance to adding blurs, light rays and vignettes. Each plugin comes with its own dialog in which you can set and adjust parameters. When multiple plugins are selected, this creates a ‘plugin chain’ - in effect, a linked list of plugins that are shown at the top of the plugin editing dialog. You can switch from one plugin to another by clicking the button in the chain, then make adjustments as necessary. This is a useful and flexible capability but, especially for a new user, it can be confusing. The problem is that while some plugins are selected from the plugin dialog, others provide video effects which are selected from a docked pane in VEGAS. Those effects are also added to the plugin chain. Each time an effect, or a plugin, is added to the chain, you are obliged to work in a popup dialog. This means you you regularly have to switch ‘modes’ from editing within the integrated environment to working in popup editors - the same is true for pan-and-crop and transitions (blurs, fades and animated effects) between clips: they all come with their own popup editors. Long-time users of VEGAS are, of course, used to working in all these popup editors and probably MAGIX has good reasons for retaining this way of working. Even so, I have to say it seems quite an inelegant way of editing at times. When multiple effects or plugins are selected, these are added to a ‘plugin chain’ seen at the top of this dialog. Each plugin in the chain can be selected in order to change its parameters. But this does mean that you have to work a great deal in dialog boxes. By comparison, many of the effects such as zooms and traditions in MAGIX’s other video editing package, Video Pro X (see my review), are added and edited in a docked window so that you can see the effects immediately applied in the preview window alongside. Personally, I prefer Video Pro X’s more integrated approach to VEGAS’s innumerable popup dialogs. Moreover, the entire user interface of Video Pro X is altogether sleaker and more modern-looking than that of VEGAS. Video rendering speed (when producing your finished video) in VEGAS is unremarkable. It’s always hard to make direct comparisons, since rendering varies greatly according to the hardware, the video output format, the selected options and the video resolution. However, it is certainly the case that VEGAS does not provide rendering at anything like the speed of the fast video rendering of Cyberlink’s PowerDirector (see my review). VEGAS comes in three different editions: Pro Edit - which is the one I’ve been reviewing ($399), Pro ($599) and Pro Suite ($799). The two higher level products include DVD creation functionality and a number of additional third-party plugins and tools for colour correction, text and title design. The Suite edition also includes Boris FX Match Move and FX Key Blend for enhanced motion tracking and chromakey (green screening). For a full list of features see the product comparison chart http://www.vegascreativesoftware.com/us/vegas-pro/product-comparison. If VEGAS is beyond your budget, there are also three lower-end editions which are called VEGAS Movie Studio (see the product comparison chart http://www.vegascreativesoftware.com/us/vegas-movie-studio-product-comparison). These have more limited capabilities (fewer effects, a more limited timeline etc.) and this product range is still at version 13 rather than 14. Overall, VEGAS Pro Edit 14 is a solid performer with lots of editing options for producing pro-quality videos. Its interface is a bit fussy for my tastes, but on the plus side the fact that this remains little changed from earlier versions makes it easily accessible to existing users. In spite of various useful additions to this release, there are no real show-stoppers. My impression is that this first new release from MAGIX is primarily aimed at providing an upgrade to current VEGAS users rather than trying to attract substantial numbers of new users. Given the increasingly competitive market in video editing software, I’d like to see some more substantial innovations in version 15. THE C LANGUAGE is consistently one of the most in-demand of all programming languages. Good C programmers command some of the highest salaries in the business. But C is a notoriously difficult language to learn. I have already taught C to over 9,500 students online – now I can help you too! In this course, I take you step-by-step from the basics of C programming right up to advanced topics such as using pointers, buffers, multidimensional arrays, the stack and heap, structs, typedefs, header files, type casts, memory allocation and file-handling.